There really isn’t much more I can say about the timeless beauty of the Sony PS-8750. Sony must have had some amazing design engineers working with them to be able to turn out a piece like this. The key thing to remember is that this deck dates back to 1975…! Visually, this is close to the Kenwood L-07D as I think one of the best-looking decks of all time. The electronic and mechanical design elements are also very strong, as you’ll see as we dive into this repair. Before you go further, check out the detailed video I made covering my service, repair and upgrade of the Sony PS-8750. The PS-8750 is also fitted with a ‘special’ mat. This mat consists of a thin rubber skin, containing a very thick oil, designed to dampen out vibrations. Sony also fitted the PS-8750 with an SBMC base (Sony Bulk Mold Compound), a proprietary compound not dissimilar to the ARCB synthetic marble Kenwood used in the KD-500/550 and KD-600/650 series of turntables. The deck has a very high-quality motor-driven arm return mechanism, big direct-drive motor and very generously sized transformer. The smoked acrylic lid even has an anti-static treatment which helps the tracking accuracy of the ultra-low tracking force cartridges the PS-8750 is designed to use. The arm pipe and headshell are carbon fibre to suppress resonances and the arm’s pivots rest on two sapphire bearings – no kidding. All in all, the PS-8750 is superbly specified for any era, mind-bogglingly so for a deck from the mid 1970’s. Nothing touches Japanese classics like these in my opinion and nothing will ever be made like them again. My approach is always to work through each problem element, one at a time, until I’ve resolved each one, or I reach an impasse. This is just how my brain works, and it helps keep everything logical. With this Sony PS-8750, I started with the arm motor drive and associated systems. Next, I moved to the electronics, rectifying previous poor work and fixing some issues with the crystal lock board, switches and controls. Then I serviced the rest of the deck, the motor, set up the arm and cleaned everything. I fitted a new cartridge, headshell wires and mat, before final testing and readjustment. I should mention that the misguided approach of replacing every capacitor without understanding the cause of a problem is proven futile by this PS-8750 example. In this case, the capacitors tested perfectly, after 40 years. They are completely unrelated to any speed or other issue in this deck and fixing the actual problems fixed those issues. By extrapolation, I suggest that capacitors are unlikely to be the cause of similar faults in other PS-8750s, despite what you might read in forums. This is a very time-consuming repair, service and upgrade, but well worth it, so let’s go! My first proper look at this beautiful machine. Wow. Very impressive design and neat layout. Sony spared little expense with the layout of the PS-8750. Note the filter capacitors and large transformer, superb quality arm-drive mechanics and separate boards for each functional circuit block. Getting the arm drive mechanics working again was my first priority. The belt is worm, and the wrong size. The drivetrain needs disassembly, cleaning and lubrication. Note the oxidised, congealed grease on the main worm dive gear. This drive gear assembly is serviceable, via a tiny ‘Jesus’ circlip and two impossibly small washers. I’m somewhat used to parts of this scale from servicing cassette decks. Disassembled, the worm drive gear slides off the shaft and everything is accessible for cleaning and lubrication. It’s important to use glide bearing type synthetic lubricant after cleaning every trace of dried lubricant from the worm gear and shaft. Everything reassembled, oiled, greased and I’ve installed a new drive belt of the correct specs. It’s difficult to see against the white nylon gear, but I’ve cleaned and lubricated the cam, all drive and driven gears and other pivot points, using a range of appropriate greases and oils. Not good. It might be tricky to see, but these pads are lifted, several are floating and broken and this accounts for the inability to adjust the deck at 45 rpm via the trimmer. More flux, someone messed with these connectors. I assume this was because they couldn’t figure out what was wrong with the deck. I pulled the crystal-lock board and worked on it at the same time. After assessing the schematic, I removed and tested components important in the motor drive and speed control circuits. To repair the trimmers, I removed them along with every broken bit of trace and pad. After cleaning and revealing fresh copper, I resoldered the trimmers and made jumpers where needed. The trimmers are now bonded to clean, firm copper and this section is now electrically and mechanically perfect. This transistor is an important part of the drive circuit. I removed it for testing and remounted it on a premium TO-66 silpad. This is the finished crystal lock board, after a lot of testing, rework, resoldering a number of critical vias and de-fluxing. And here it is back in the PS-8750. Note the re-mounted 2SC1341. A closer view. By the way, these premium Elna capacitors measured so well, they were better than some new parts I had on hand just in case. I have hundreds of these TO-66 silpads. As you can imagine (TO-66 devices are rare), I get quite excited when I able to use one! Anyway, fixing the crystal-lock board fixed the strobe. Correctly orienting the strobe means it is now nice and bright! At this point, I’ve resolved all drive and mechanical faults with the deck, a great result. The motor needs lubrication, best to do this first and let the cleaning remove and fingerprints, oil etc. This approach removes the light coating of grime from everything and protects and shines the surfaces. It’s time-consuming and detailed work, but worthwhile. The PS-8750 looks great now. This foot came apart, I repaired it with a fast-setting clear epoxy. Probably stronger now than new! The supplied T4P cartridge was completely wrong for this deck, incorrectly fitted and needed a stylus. I advised the customer on a few cartridge options and, given that I am able to do some pretty good deals on Ortofon gear, I supplied him with a superb Ortofon 2M Black, at a very competitive discount on the $999AUD retail price. I removed the puny Sony headshell wires and installed a nice set of Audio Technica replacements. This is a massive improvement, well worth it with a deck and cartridge like this. Beautiful, and the 2M Black sounds a million bucks on this deck. Arm height needed adjustment, as dis the bearing itself, the lateral weight, anti-skating, arm lifter etc. Sadly, the trick Sony platter mat is warped beyond usability now. I fitted premium dark cork mat that I think looks a million bucks. Sonically, this is also probably an improvement and it is dead flat, which we want. This is the tedious stuff that few others do and that makes all the difference. Setting vertical tracking angle, extremely important when the cartridge in use has a Shibata diamond. The Sony PS-8750 looks and sounds fabulous. Note the now adjusted anti-skate and lateral balance weights. So people have been asking me what I think about this beautiful Sony PS-8750. I honestly think it’s a wonderful machine. I listened to this one several times whilst I was testing her and she sounded fantastic. Immediately obvious to me, fitted with new Ortofon 2M Black cartridge + Shibata stylus and quality new headshell wires, is the air, space and detail present. The cartridge/deck combination has a lovely relaxed sound to it, with great depth and scale. This is likely to be a non-fatiguing combination over the longer term and the sound will only improve as the cartridge breaks in. Here are some final views of this wonderful PS-8750. I think the cork mat really adds something. Love the smoked acrylic lid. If you find one of these for a sensible price, grab it. The arm is very adjustable to suit the cartridge you use with it. Azimuth, arm height, arm lifter, lateral weight and of course the standard adjustments are all possible with this deck, and you need them to get the most out of a good cartridge. In terms of the deck itself, for me it’s an absolute winner in terms of looks, sound and potentially value as well. 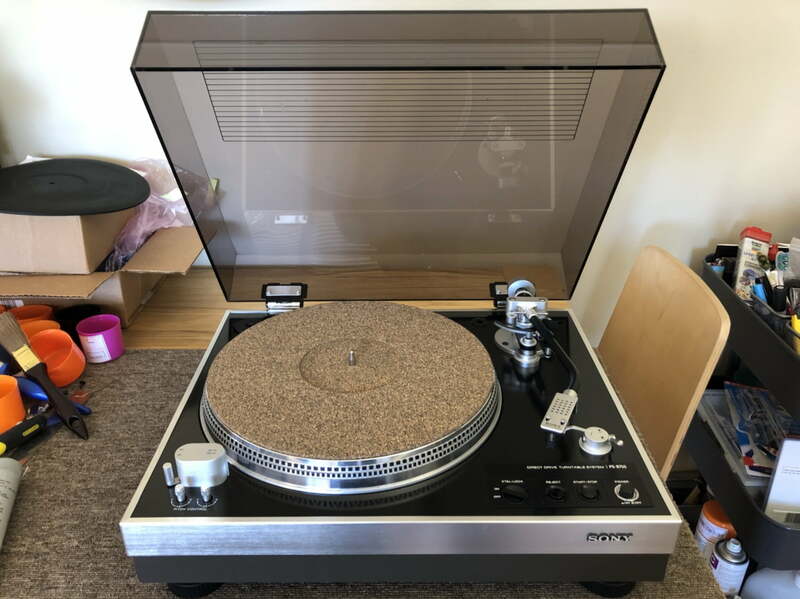 I’m not sure what these decks go for now, but if you could get one for say $1500 – $2000AUD and spend a little on a nice cartridge and careful service and set-up, you’d have a really heavy hitting turntable. Nothing new at these prices comes even close. When one factors in the engineering and tactile quality of the Sony PS-8750, with such smooth and solid feeling controls and switches, it has few peers stylistically and sonically. I’m sure her owner will be very happy to have her home! If you’d like me to look over your Sony PS-8750, or any other turntable, don’t hesitate to get in touch! Previous PostRare Luxman M-4000 Power Amplifier Repair & ServiceNext PostMerry Christmas & Happy New Year! Yet another fascinating repair/review of a classic deck from the Golden Age of Analogue audio. So nice to see someone take pride in their work and sharing the passion of lovely sounding audio from yesteryear. Thanks so much Simon, much appreciated and really glad you liked the article!